Happy Friday friends - this week felt extra long, but we made it to Friday!! Yesterday was my 3 year blogiversary!! I honestly can't believe that for three years I've been coming to this little space and sharing my life with you all! I also can't believe that I've made so many friendships (taking a trip with two friends who started out as blogger pals is just one example) with so many bloggers! Is it sad that I really don't remember what I did to occupy my time before blogging...I mean I was always working and planning our wedding right before I started this, but before that - not a clue! I thought I'd share a few of my favorite things over the last three years! Co-hosting a link up that has been going strong for 2 years! Weekending is officially in my vocabulary now!! Creating a 30 before 30...I'm about 4 months away from this big birthday and I've been crossing things off here and there. Not sure I'll get it all done, but I'll try! Starting the B~Inspired Series - it's evolved a bit over the last 2 years and I can't wait for more exciting features next year! Can I just say YOU...every single person that I have gotten to know - because truth be told we all know each other in a weird way!! I love that there is someone that I can reach out to when I have a question about where to stay in a city or what they though about a certain product to asking about the fit of a shirt and knowing that you all will tell me the truth, because we're all friends! So what's next for B~Loved?! Over this last year I've taken a step back from 5 posts a week to 3 and that is ultimately where I feel the most comfortable in terms of juggling everything! With that being said, I do hope to continue to grow this little space! It's high time that I created a media kit - it's been on my to-do list for the longest time and I'm happy to report that I finally downloaded a template from etsy that is going to make it so easy to complete this task! Maybe even this weekend!! Having a clear focus on social media - specifically Instagram for the next 6 months! I also want to incorporate more videos specifically makeup tutorials! As always if there is anything that you want to see - please let me know! It's crazy that I can look back on practically every single important moment over the last 3 years and know what we did & who we spent time with, not to mention all of the trips! Thank you all so much for reading, commenting, asking & answering questions and being one of the greatest support systems out there! Hope you have a great weekend and I'll see you back here Monday!! Happy blogiversary!!! 3 years is so awesome - can't wait to see what you have coming up! Happy Blogiversary!!! I know I am honored to know you and come visit your sweet, chic blog. Your heart is the biggest in all of Blogland and I think I speak for many when I say we are enriched and inspired by you! You're beautiful inside and out!! Happy blogiversary!! Exciting times ahead for your blog. So glad I discovered your little space! Happy 3 years!!! I'm so glad I found your blog and I'm glad you do a Monday link up ha! Can't wait to see how you grow your blog! Happy Blogiversary, Biana! Congratulations on three years! Can't wait to keep following along! Have a great weekend! Congratulations on three years!!! I'm so glad I found your blog and that we've gotten to know each other! A gator & my birthday twin?! It was meant to be! Have a wonderful weekend!! Happy Blogiversary! So glad I found your blog a couple of years ago! Happy Blogaversary Biana! So proud of what you have done with space and I honestly do not know how you do it all, with your fabulous Wedding planning business and a full time job too? You are truly an inspiration! Congrats for reaching this milestone! Happy 3 years lady! So glad we were able to meet in person in CHS :) A template for the media kit helped me SO much! Happiest blogoversary! And congratulations on 3 years! I'm so happy to have met you and call you a friend. Can't wait to see more as the years go on. Xo! Happy Blogiversary!!!! I for one am glad I met you through blogging. Looking forward to many more posts from you :) Have a great weekend! Happy happy blogiversary! Yess to more tutorials/videos and I can't wait to keep up with the B Inspired series- it's one of my favorites! Congrats on so many huge accomplishments in just a couple of years! Happy 3 year blogiversary lady! It's so awesome to see how far you've come and how many opportunities have come along the way! So glad we got to connect through our blogs! happy 3 years girly! so exciting! i love that we've "met" (someday IRL) and i just adore your pretty face and awesome blog. have a wonderful weekend! Congratulations on three years! Wishing you many more successful years! Happy 3 years! Time seriously flies! I always regret not doing a 30 by 20, I think I have it hald written from a few years ago, haha! I guess I still have a little bit of time! Happy Blogiversary, beautiful! I'm so glad we've connected and you know what, I don't even remember how long ago that was because I feel like I've known you for a long time! That's one of the beautiful things about blogging and connecting with other like-minded people here, you start to build relationships with people that you've never met in person, but feel like you've known for years and years! It's awesome and so admirable what you've accomplished in establishing a wedding planning business and that you've already booked 3 weddings for next year!!!! I wish you all the best in growth and success in EVERYTHING you do, girl! Sending lots of love and hugs your way, have the best weekend ahead celebrating! Happy blogiversary, girlfriend! It has been so fun to follow along and get to know you these last few years. You've accomplished so much, and I can't wait to see what you do next! Congrats! Happy Blogiversary! So glad I found you fairly quickly in my blogging life. :) I finally nailed down a media kit in October but ended up hiring it out and I love the results. It's a nice thing to have on hand. Have a super weekend! Can't wait to see what this year will hold for you. What an amazing 3 years!! That's really awesome. Congratulations! You really have accomplished so much. 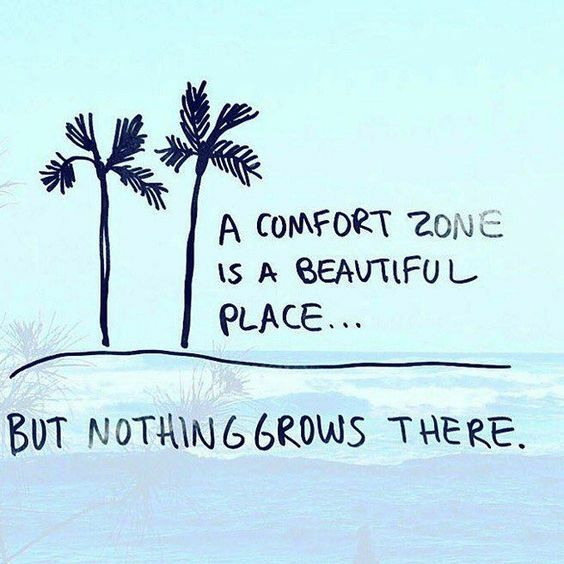 And I love that comfort zone quote. How real is that!! Hope you have an awesome weekend! Congrats on 3 years. I've seen the amazing transformation of your blog into the beautiful thing it is today. Happy 3 years! Your blog has definitely been one of my favorites to follow! You have accomplished so much in 3 years! I would love if you posted make up tutorials! I'm pretty obsessed with watching them on youtube! Happy blogiversary!! You are a beautiful person inside and out. Even though we haven't met in person I consider you to be a friend. :-) I hope that we can meet in either Boston or Chicago some day too!! Have a wonderful weekend!!! Wohoo! Congrats, sweet friend! I just started reading your blog this year and I'm so glad to have found you. I remember coming across your blog and literally binge reading it! You were made for this, girl! Wishing you many more successful years! Putting a media kit together is easier than you think, I actually made my own template. I planned on creating it as a downloadable for others but haven't finished it and don't know how to make it where once you download it...you can edit it too. I'm so happy to hear that you want to incorporate more videos...I can't wait! happy blogiversary girl!! 3 years, that's awesome! you are right, it's so great to know you have someone you can ask about a certain place or thing, and there is always someone to talk about something with. congrats on your link up too, i totally say weekending all the time now lol. have a good weekend! Congratulations!! I absolutely love the idea of a 30 Before 30 list and I'll definitely have to keep that in mind for myself! Congrats on 3 years of blogging - you have created a pretty amazing space!! Congrats on the blogiversary! I love your B~Inspired series, it's always motivational to learn from other bloggers. Happy Blogiversary, B!! I'm so glad that I've gotten to know you... you're one of my favorite daily reads! And girrrrl, I need a media kit so badly, too! It's on my to do list for the beginning of the year! 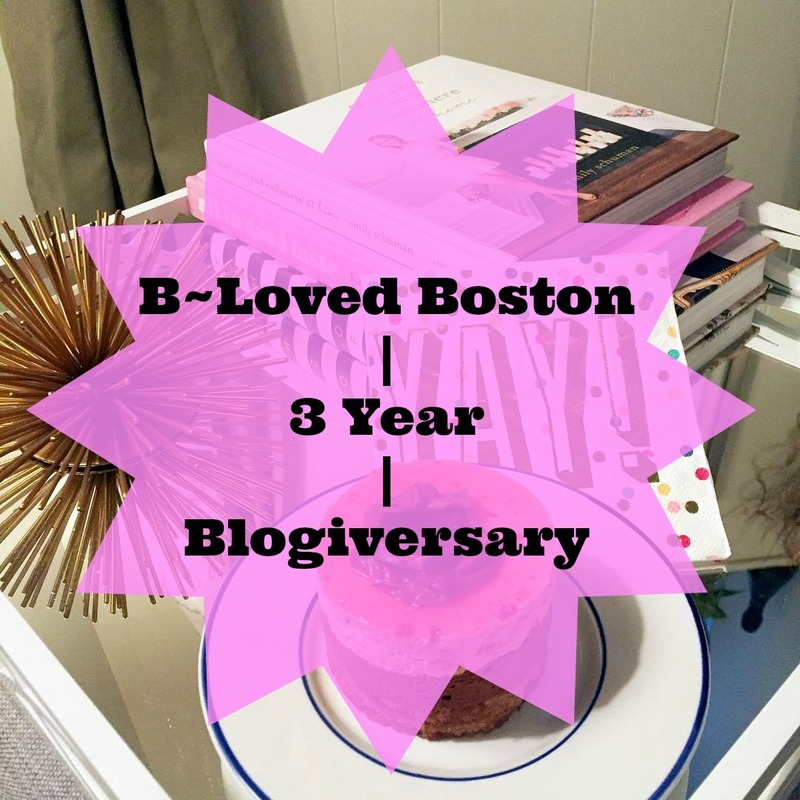 Happy blogiversary girl, can't believe it's been 3 years!! You know yours is one of my favorites to read and glad we have become blog friends! Happy blogiversary! I always love coming to your blog to read all of your posts, and weekending has been one of my favorite linkups! I hope that you're able to accomplish all of your blog goals for the next year! Just opened a window to check out your "30 before 30" list. I have 14 months until that birthday, so I'm intrigued! Good luck with your media kit! I love having one to send to those interest in collaborations. It's a huge time saver! Happy Blogiversary!! How awesome to go back and look how far you've come! Weekending is definitely in your brand now. Happy anniversary! I mean I'm so glad we met through blogging and our husbands now know that we weren't cat fishing each other ;-) I loved our pen pal long emails back to each other in the beginning. Congratulations for sure a big milestone! Cheers to three years!! So exciting!! Happy blogiversary girl!! It's been a great 3 years for you! I'm with you on the need for a media kit; it's on my list too. Excited to see where this next year takes you! Congrats on three years! Sounds like it's been quite an adventure! Happy bloggiversary Biana! I can't wait to see what's in store for you! Congrats on three years babe! I seriously need to make a media kit already. Happy blogiversary, friend!! I love following along with you!! Happy 3 years, girl!!! Can you believe we've been blogging for this long already?! So happy to have 'met' you through this little online world! Happy 3 Year Blogiversary! Its amazing how many things you have accomplished. You should be super proud!